Originally printed in the Winter 2018 publication of the Kansas Family Physician. The first week of December 2017 marked the beginning of my 29th year at KAFP. How did that much time whiz by? And since we are celebrating KAFP’s 70th anniversary, it seems appropriate to look back over my years with the Academy. Rather than using a lot of words I thought I’d use some pictures and numbers to illustrate my 29 years serving as your executive. 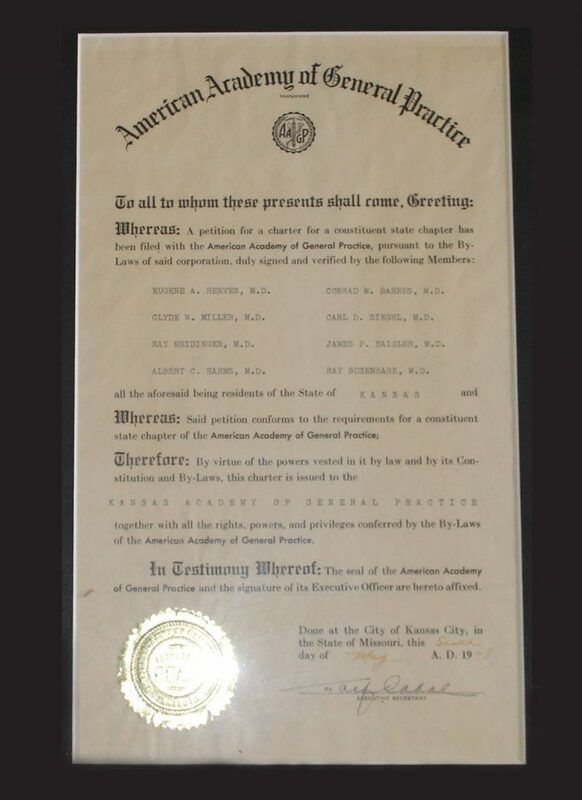 KAFP was chartered on May 6, 1948. Here is a picture of the charter document, which hangs just outside my office. The first Executive Director of the Kansas Academy of General Practice, as it was known then, was Gene Wilcox, of Winfield, Kansas. He started in about 1950-51 and traveled the state speaking to GPs and signing them up as members. He served as the Chapter Exec for 35 years. He is pictured receiving a plaque upon his retirement. I met Gene several times before he died, and had the privilege of giving a eulogy at his funeral. 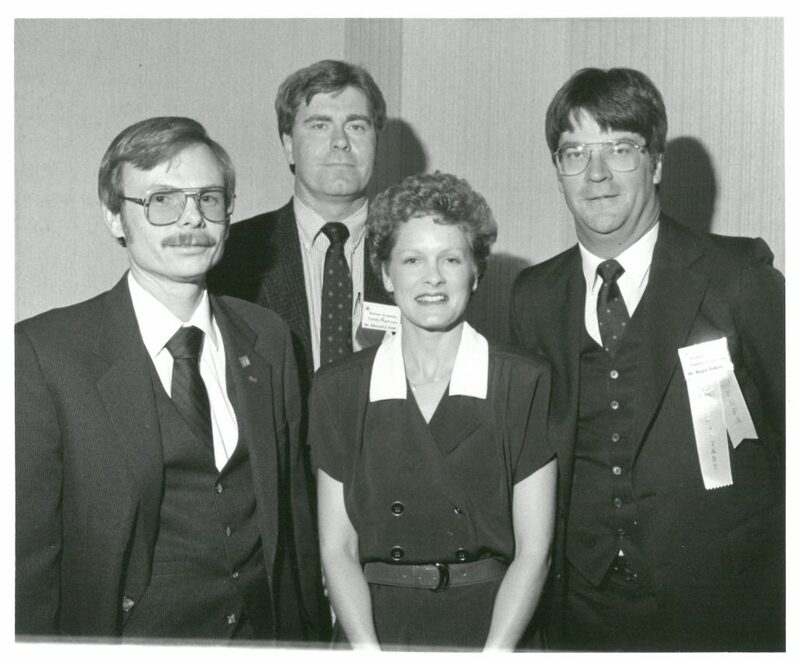 During Gene’s tenure George E. “Ned” Burket Jr, MD, was elected as president of the American Academy of General Practice (AAGP), and a few years later, Ernie J Chaney, MD was the second Kansan to become a national president. Other notable national activities during those years: AAGP became AAFP (American Academy of Family Physicians), the American Board of Family Medicine (ABFM) was born, and family medicine residency training programs began to spring up across the country. Gayle Stephens, MD, another Kansan, was a huge influence upon the specialty, and was instrumental in starting Wesley Family Medicine in 1969. The first Executive Director of the Kansas Academy of General Practice, as it was known then, was Gene Wilcox, of Winfield, Kansas. He started in about 1950-51 and traveled the state speaking to GPs and signing them up as members. He served as the Chapter Exec for 35 years. He is pictured receiving a plaque upon his retirement. I met Gene several times before he died, and had the privilege of giving a eulogy at his funeral. 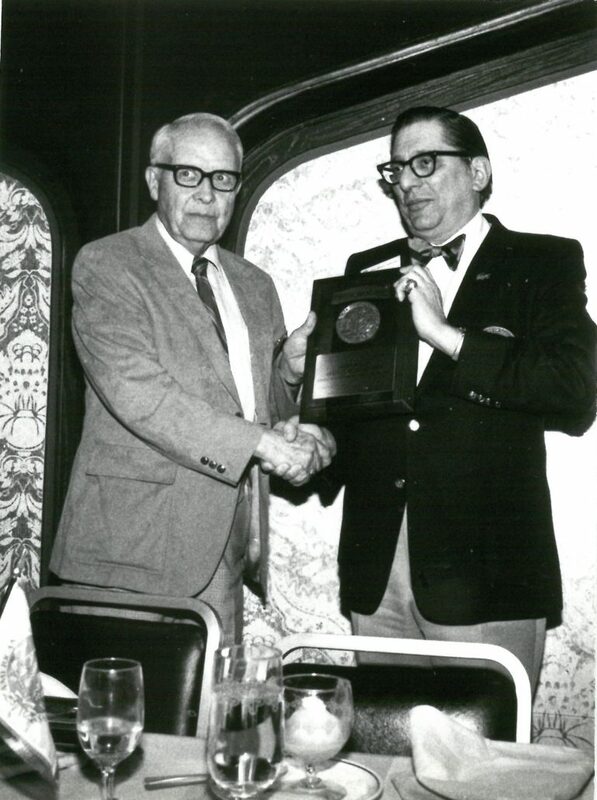 During Gene’s tenure George E. “Ned” Burket Jr, MD, was elected as president of the American Academy of General Practice (AAGP), and a few years later, Ernie J Chaney, MD was the second Kansan to become a national president. Other notable national activities during those years: AAGP became AAFP (American Academy of Family Physicians), the American Board of Family Medicine (ABFM) was born, and family medicine residency training programs began to spring up across the country. Gayle Stephens, MD, another Kansan, was a huge influence upon the specialty, and was instrumental in starting Wesley Family Medicine in 1969. The next KAFP Executive Director after Gene was Walt Bettis. He served for three years. I started in 1989. This is part of the leadership team that hired me in December of that year. L to R: Rick Rajewski, MD, (Hays); Ed Lind, MD (Derby); Debbie Haynes, MD (Wichita); and Roger Tobias, MD (Lyons). The next KAFP Executive Director after Gene was Walt Bettis. He served for three years. I started in 1989. This is part of the leadership team that hired me in December of that year. L to R: Rick Rajewski, MD, (Hays); Ed Lind, MD (Derby); Debbie Haynes, MD (Wichita); and Roger Tobias, MD (Lyons). A young physician by the name of Rick Kellerman, MD, was elected to join this group of officers as secretary/treasurer. He was in that office the year I began, and I felt I “grew up” in the Academy with him. Dr. Kellerman has been a leader in every sense of the word during my entire tenure. And I am grateful. He was the third Kansan elected to be a national president, serving in 2006-07. 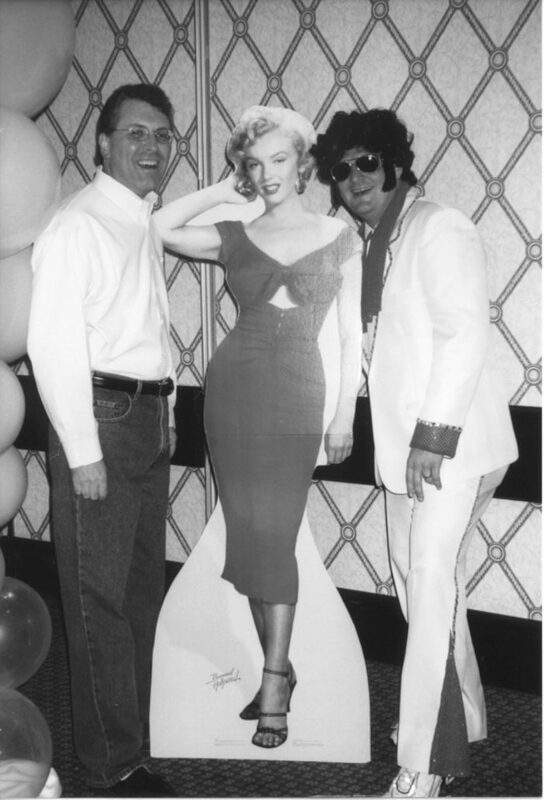 We had a lot of fun with his election campaign, in which the slogan was “Rock & Roll with Rick.” We had visiting guest stars: Elvis Presley (AKA Jon Sides, MD) and Marilyn Monroe (she was a little stiff) with us at the AAFP Congress of Delegates hospitality room. More seriously, under the leadership of Dr. Tobias, Dr. Lind and Dr. Kellerman, KAFP wrote and published a white paper in 1991, titled Where Have All the Doctors Gone? When Will They Return? It was a major influence with the legislature and KU School of Medicine. A young physician by the name of Rick Kellerman, MD, was elected to join this group of officers as secretary/treasurer. He was in that office the year I began, and I felt I “grew up” in the Academy with him. Dr. Kellerman has been a leader in every sense of the word during my entire tenure. And I am grateful. He was the third Kansan elected to be a national president, serving in 2006-07. We had a lot of fun with his election campaign, in which the slogan was “Rock & Roll with Rick.” We had visiting guest stars: Elvis Presley (AKA Jon Sides, MD) and Marilyn Monroe (she was a little stiff) with us at the AAFP Congress of Delegates hospitality room. More seriously, under the leadership of Dr. Tobias, Dr. Lind and Dr. Kellerman, KAFP wrote and published a white paper in 1991, titled Where Have All the Doctors Gone? When Will They Return? It was a major influence with the legislature and KU School of Medicine. Governor Mark Parkinson signs the Clean Air Indoor Act bill in 2010. Note a certain tall physician in the back row: Mike Munger, MD. He was our chapter president that year. M2, as we fondly call him, has, of course, gone on to even greater heights, serving as AAFP President this year! 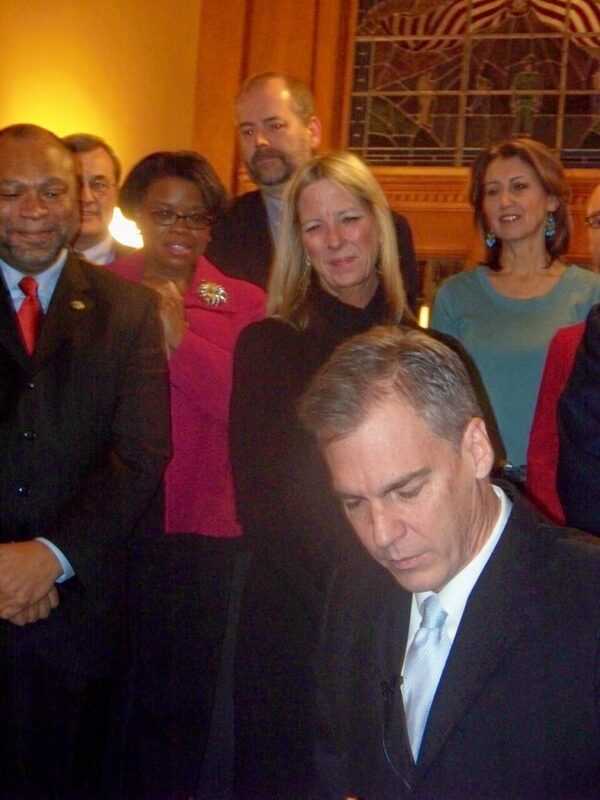 Governor Mark Parkinson signs the Clean Air Indoor Act bill in 2010. Note a certain tall physician in the back row: Mike Munger, MD. He was our chapter president that year. M2, as we fondly call him, has, of course, gone on to even greater heights, serving as AAFP President this year! Here’s a picture of 2017-18 AAFP President, Mike Munger, MD, FAAFP with Drs. 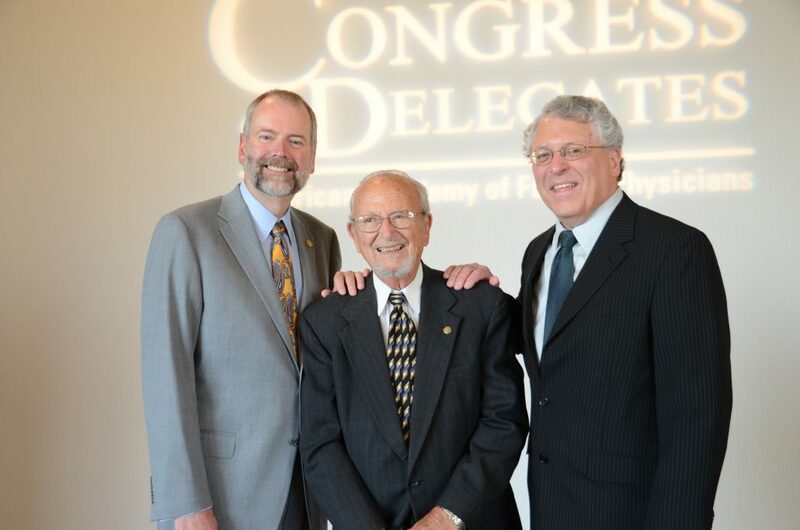 Kellerman and Chaney, three of four Kansans who have served as AAFP presidents. Here’s a picture of 2017-18 AAFP President, Mike Munger, MD, FAAFP, with Drs. 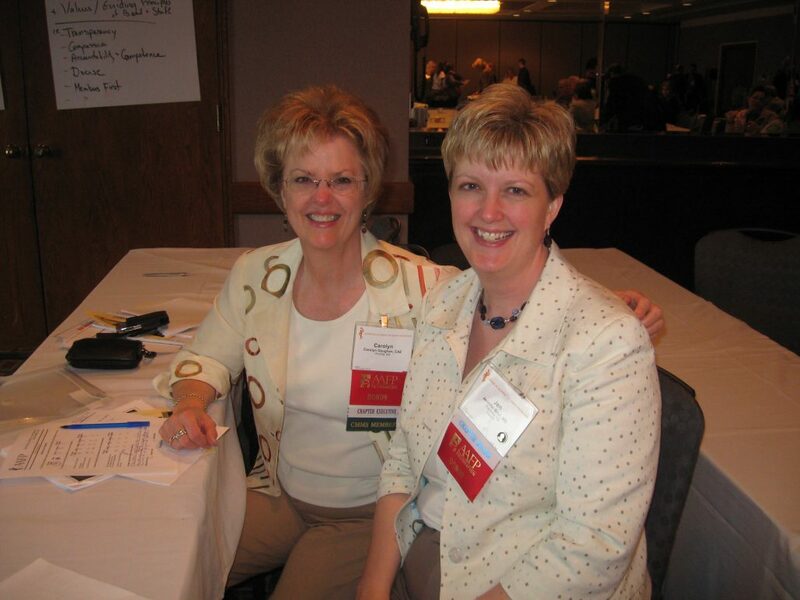 Kellerman and Chaney, three of four Kansans who have served as AAFP presidents. Besides being KAFP’s 70th year, 2018 is the KAFP-Foundation’s 35th anniversary! Besides those already mentioned, I could call out many other leaders: Drs. John Eplee, Diane Klingman, Joe Davison, Carol Johnson, Bob Moser, Lee Mills, Deb Clements, Chris Cupp, Doug Gruenbacher, Diane Steere, and our current line-up: Drs. Lynn Fisher, John Feehan, Jeremy Presley, Sheryl Beard, and Chad Johanning. Every year I have the privilege of working with the best of the best, our chapter presidents! All our presidents are listed on our website and I hope you’ll look through that “hall of fame.” I could reminisce about each… but lack of space prevents me from waxing eloquent for too long. I will say that one of my hardest tasks each year is “giving up” the close relationship that develops with each president. We speak weekly and work together closely and almost always become good friends. In June, the president becomes board chair and we stay friends of course, but I miss the weekly contact and relationship through which we accomplish many, many projects and programs together. Note: According to the inflation calculator, $175 from 1990 is worth $335.06 in 2017. One could argue that we haven’t kept up with inflation, and dues have actually gone down. I hope this little trip down memory lane will prepare you for KAFP’s 70th anniversary which we celebrate during the entire year of 2018! Come to the Annual Meeting, June 14 – 16 at the Marriott in Overland Park. We will celebrate 70, together! And I’ll be celebrating 29.